We are a design/build firm, which means that all of the steps related to building your custom home are handled in-house. Rather than having to deal with multiple contractors and points of contact, you work with us throughout the entire home building process, making for a more seamless and efficient experience and reducing the amount of time required on your behalf to act as go-between with various contractors. Simply put, design/build simplifies the process of designing and building a custom home, saving you time and money. We’ll explain our process in more detail soon, but first, here’s an introduction to our communication style and what you can expect from us. 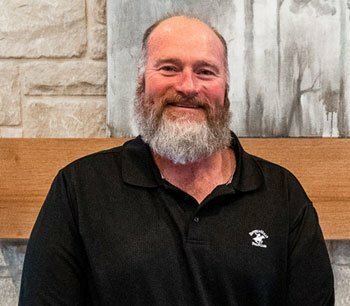 Meet Charlie Caple, one of our Superintendents. You will be paired with one of our outstanding Superintendents. He or she will serve as your main point of contact throughout the construction process. Using Buildertrend, your Superintendent will email you daily logs with progress updates on your home. These daily overviews tell you what happened that day and what is going to take place over the next few days. Should you have any questions, you’re always welcome to call or email your Superintendent directly. 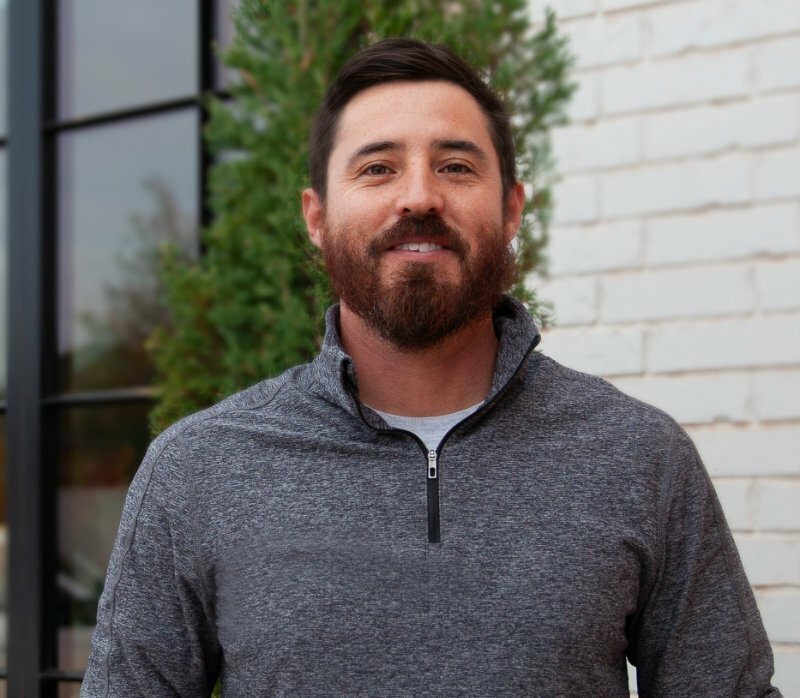 As a custom builder, we are always open to modifications and adjustments to the original plan, and we want to make those changes as smooth and cost-effective as possible. That’s why we incorporate multiple walk-throughs in our process, letting you see the work in-person and make changes before critical elements are installed or finished (e.g., location of outlets, flooring direction, closet layouts, etc.). Should you decide to make modifications to the original plan, our Lead Estimator will upload the details and costs to Buildertrend. We’ll await your final approval before implementing any changes. Following is a step-by-step overview of our design/build process. Each step is color coded so you can see where you’ll be working directly with us, and the steps we’ll handle as a part of the process. If you have a specific homesite in mind where you’d like to build, we’ll work with you to develop a floorplan that fits your needs and accommodates the lot. You may find a floorplan from our current selections or you may wish to create one from scratch; either way, we can assist you. If you already have a specific floorplan in mind, whether it’s one of ours or from another home designer, we’ll work with you to find the perfect homesite on which to build it. Our Design Specialist will meet with you to discuss in detail the features that you’d like to see in your new home, whether that’s a laundry room connected to the master closet, a nook off of the kitchen that serves as a small study, or a wine cellar. She’ll also ask you to send her photos of homes that you admire to help her get a feel for your style. The next time you meet with the Design Specialist, you’ll receive a preliminary copy of your customized floorplan and will also get to view a 3D architectural rendering of the exterior of your home. Once everything is to your liking, our Design Specialist will create preliminary construction drawings as we begin to work on a preliminary estimate for your home. 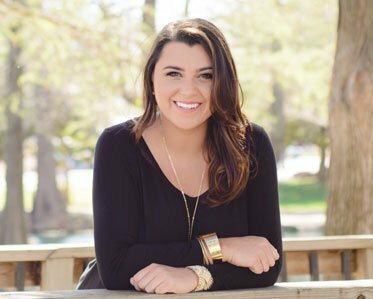 Meet Allie Roberts, our Design Specialist. 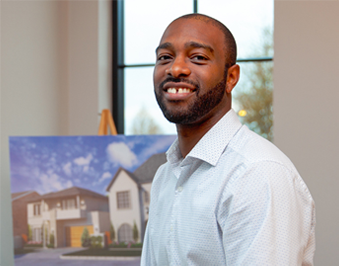 Meet Marlon Robin, our Lead Estimator. Next, our Lead Estimator will take the preliminary construction drawings and develop an estimate for your home. The pricing proposal will list out all of the expenses associated with building your home, which we’ll review with you in detail. Once we are in agreement on the terms, your final construction drawings are completed, your pricing and proposal are finalized, and we go to contract! After we have a signed contract, we will secure the necessary permits to begin building your home. Meanwhile, your Design Team, which comprises our Design Specialist and Interior Designers, will begin building out the interior of your home in the 3D software program. You’ll send them more inspiration photos, this time of home interiors, and they’ll design the interior and invite you for a virtual tour. Kitchen layout and cabinetry as well as closet design will all be firmed up at this point. For an additional fee, you can even get photorealistic architectural renderings of the interior to show family and friends what you’re building! 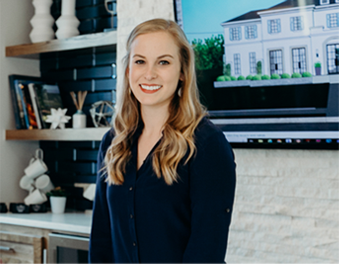 Meet Abby Allen, our Interior Designer. You will also meet with our Interior Designer during this phase of the process to pick out the finishes for your home, such as tile, countertops, hardware, and more. Our Interior Designer will meet you at our recommended vendors and offer her expertise as you make your selections. She’ll also be there for all walk-throughs to ensure what was selected is implemented properly and to your satisfaction. Our customers greatly appreciate her guidance and knowledge. Before construction begins on your new home, you will come to our office for an initial meeting with the team. They’ll give you a thorough overview of what to expect during the construction process as well as answer any questions you might have. Based on what is in your contract, we will select the windows and doors for your new home. The first step in the construction process is to lay the foundation for your new home. The placement of pipes and in some cases the HVAC ducts and vents are established at this point in the construction process. Once the foundation is in place and the placement of pipes, ducts and vents are established framing and roofing can begin. Once the framework and roof are complete, we install the windows and exterior doors. At this point, plumbing valves are set in the proper locations in the walls. The furnaces are set and the duct work is also completed. You’ll meet at the home with your Construction Team, comprised of your Project Manager, Interior Designer, and Superintendent. During the walk-through, we’ll determine placement for all electrical outlets, as well as any specialty items such as USB plugs. We will also layout the placement of your light fixtures. High-quality insulation is laid throughout the home, and drywall is installed on all interior walls. You’ve already selected tile and other flooring when you met with our Interior Designer on-site at our various vendors. Now that your home is taking shape, you will meet with your Construction Team again to see first-hand what it looks like and decide if you want to change any directions to the flooring before it is installed. Typically, this meeting will take place at the same time as the Tile Walk-Through. You’ll go over the exterior veneer to confirm that any accent bricks or capstones are to your liking. With your final approval, the exterior of the home is completed. 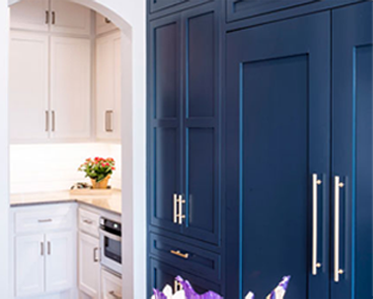 You’ve already designed the majority of the cabinetry in your new home with the Design Specialist, as part of the Design phase. During the Trim Walk-Through, you will confirm the layout of closets (racks, shelves, shoe racks, etc. ), pantries, and any mantels or beams. Trim, cabinets, and closets (including pantries) are installed throughout the home. Fresh paint is applied throughout the home, according to the colors you’ve selected. You’ll receive the plan for landscaping, designed by a professional landscaper. You can make adjustments to the plan, and then once it is approved, landscaping begins. The final finishes are installed, such as light fixtures, thermostats, and plumbing fixtures. Meet with the Project Manager to walk through your finished home and make a list of any deficiencies or changes. The construction crew will go through the list and carry out any touch-ups. At the final walk-through, you will ensure that all punch list items have been completed to your satisfaction. Your finished, custom home is now ready for you! At the closing, you’ll complete all paperwork and receive the key. Meet Daniel Mayabb, our Warranty Manager. At the end of 30 days, the Warranty Manager will meet with you to go over any concerns you have regarding the functionality of your new home. He will make note of any items that need to be addressed and arrange to have them fixed. After 11 months, the Warranty Manager will once again come to your home and go over any concerns you have. He will make arrangements to have those items fixed, at no cost to you.